Home » News » UNESCO Again Calls Hebron Part of "Occupied Palestine"
UNESCO Again Calls Hebron Part of "Occupied Palestine"
Muslim countries orchestrate declarations that culturally appropriate Jewish history. Two declarations sponsored by the representatives of Egypt, Jordan, Lebanon, Morocco, Oman, Qatar and Sudan passed in the United Nations Educational, Scientific and Cultural Organization attacking Israel. International spokesman for the Jewish Community of Hebron Yishai Fleisher called it "nothing but national-identity theft. The jihad uses UNESCO as a legitimate face in their mission to delegitimize the Jewish people’s rights to the land of Israel, so they can continue their war against us." 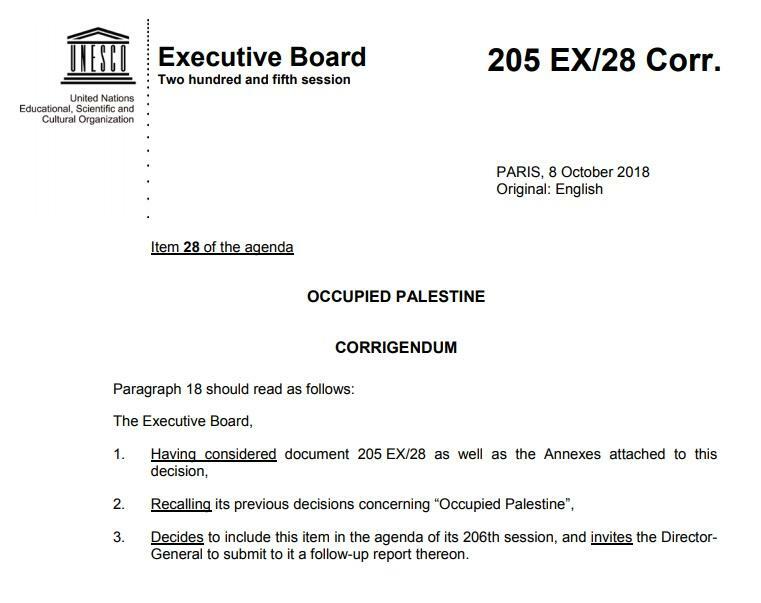 The latest documents are not resolutions, but annexes to declarations that were approved by the Programme and External Relations Commission of the Executive Board of UNESCO on Wednesday October 10, 2018. 13. Reaffirms that the two concerned sites located in Al-Khalil/Hebron and in Bethlehem are an integral part of the Occupied Palestinian Territory, and shares the conviction affirmed by the international community that the two sites are of religious significance for Judaism, Christianity and Islam. It is unclear what "wall" exists in the "Old City" [i.e. Israeli section] of Hebron, or to which roads the declaration refers, since the Jewish community has access to only 1% of Hebron and any construction or even moving to an apartment needs to be approved by the Defense Ministry. Also, many interpret UN Security Council Resolution 446 as having no relevance to Israel's control of Judea and Samaria because it is part of the historic homeland of the Jewish people. Hebron is a prime example of Jewish communities existing millenia before the Six Day War of 1967, yet ironically, Muslim nations use it as an example of Israeli aggression. The 2012 Levy Report on the Legal Status of Building in Judea and Samaria is an 89-page report that declares Israel's presence in the West Bank not to be an occupation as defined in the Fourth Geneva Convention. Also flying in the face of the new UNESCO declarations is the fact that the Palestinian Authority controlled part of the Hebron is completely off limits to Israelis, despite containing four holy sites specifically approved for access in the 1997 Hebron Accords. These sites are: Ein Sarah, Elonei Mamre, the Cave of Otniel Ben Knaz and the Oak of Abraham. The other section of the UNESCO declaration released on Wednesday condemns Israel for harming "the Old City of Jerusalem and its Walls, a site inscribed on the UNESCO World Heritage List and on the List of World Heritage in Danger." The Jerusalem Post reported that Nicolas Kassianides, UNESCO's assistant director-general for external relations, as welcoming "the spirit of constructive dialogue that enabled to reach a consensus," and "confirms the positive momentum that started last year, especially on this subject which is very sensitive." It was in July of 2017 that the Palestinian Authority through their Alternate Permanent Delegate of Palestine to UNESCO succeeded in manipulating UNESCO into declaring Hebron's Tomb of the Matriarchs and Patriarchs a "Palestinian world heritage site in danger." As a result, United States ambassador to the UN Nikki Haley oversaw the US withdrawal from UNESCO and Israel shortly after followed suit. In protest, Ambassador Haley wrote a letter to the the UN Secretary General stating, "the Tomb of the Patriarchs, which is sacred to three faiths, is in no immediate threat. Such a designation risks undermining the seriousness such an assessment by UNESCO should have. Many precious sites — from the Democratic Republic of Congo to Libya to Iraq to Syria — are under real and imminent threat of destruction today. They urgently demand UNESCO’s full and immediate attention, which should not be wasted on this sort of symbolic action." Ambassador Haley later stated of the incident, "At the UN and throughout the UN agencies, Israel does get bullied. It gets bullied because the countries that don't like Israel are used to being able to get away with it. Just like when I was that little girl in South Carolina, that just doesn't sit well with me. As many of you know, one of the UN agencies with the worst track record of Israel bias is UNESCO. Among many other ridiculous things, UNESCO has the outrageous distinction of attempting to change ancient history. UNESCO recently declared one of Judaism's holiest sites, the Tomb of the Patriarchs, as a Palestinian heritage site in need of protection from Israel. That was enough. Ten months into this administration, the United States withdrew from UNESCO." Haley, who had been an ardent supporter of reform in the United Nations retired from her postion on October 9, 2018. Prime Minister Benjamin Netanyahu later spoke at the United Nations where he mocked the resolution stating, "So is there no limit to the UN's absurdities when it comes to Israel? Well, apparently not. Because in July, UNESCO declared the Tomb of the Patriarchs in Hebron a Palestinian World Heritage Site. That's worse than fake news; that's fake history. Mind you, it's true that Abraham, the father of both Ishmael and Isaac, is buried there, but so, too, are Isaac, Jacob, Sarah, Rebecca - Sarah's a Jewish name, by the way - Sarah, Rebecca and Leah, who just happened to be patriarchs and matriarchs of the Jewish people. Well, you won't read about that in the latest UNESCO report, but if you want to, you can read about it in a somewhat weightier publication. It's called 'the Bible.' I highly recommend it. I hear it even got four and a half out of five stars on Amazon. And it's a great read. I read it every week." Carmel Shama-Hacohen, Israel’s representative to UNESCO until this year was able to hammer out a "compromise" in which future anti-Israel resolutions would adopted as an annex, and not within the body of the text. Shama-Hacohen credited the newly appointed head of UNESCO Audrey Azoulay as attempting to curtail Arab countries manipulation of the UN system. Thus some officials saw this week's declarations as a small but positive step as opposed to the previous resolutions since they were passed by consensus as non-binding annexes, the JNS reported. Israeli Ambassador to the United Nations Danny Danon stated "This is further evidence—for anyone who did not understand why the United States and Israel withdrew from UNESCO—that again proves that UNESCO is a body based on lies and biases, and is deliberately acting against us. The State of Israel will not be a member of an organization that is trying to rewrite history and willing to be manipulated by our enemies. The State of Israel will not be a member of an organization that is trying to rewrite history and willing to be manipulated by our enemies."